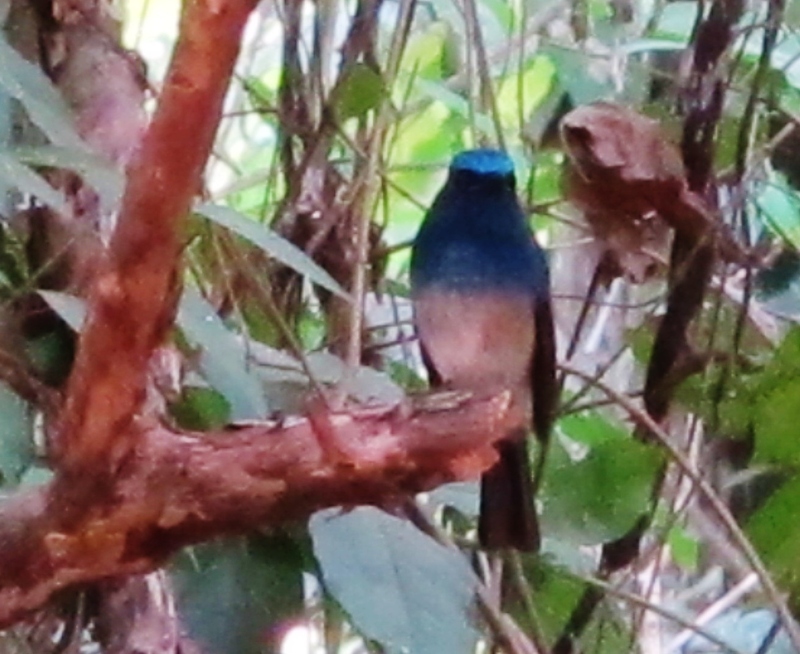 Male Hainan Blue Flycatcher, Banteay Srei, February 8th. Another “non-birding” day around the Angkor temples, which nonetheless produced several very interesting sightings. First up was Preah Khan, where an identification headache was immediately provided by a female-type green pigeon, very high in an enormous dead tree. Its position meant that views of anything other than its undercarriage were impossible. Some very grainy and distant photos, which when combined with a thorough look at possible confusion species on the internet later, confirmed my suspicions that it was a female Wedge-tailed Green Pigeon. The literature suggests that this bird is uncommon at lower altitudes. I wandered into some rather good lowland forest to the side of the main entrance track, where a Pale-legged Leaf Warbler eventually gave itself up for some diagnostic views – and its habit of feeding low down near the ground is also distinctive. Nearby, I could hear an even better bird calling – a female Siberian Blue Robin – which again I eventually managed to see. This species is a bit of a skulker but with a very distinctive habit of shivering its tail. Also at Preah Khan: a small flock of Hill Myna and a White-rumped Shama. Next, we traveled a considerable distance to the wonderful temple of Banteay Srei where a male Hainan Blue Flycatcher (see record shot above) was the star. This species is regular in forest around the Angkor temples. Marshland close to the temple held a Bronze-winged Jacana, but attempts to identify a briefly-glimpsed small cuckooshrike (I suspect Black-winged Cuckooshrike) were thwarted by the persistence of small children selling postcards. Finally, Banteay Samre temple produced nothing unusual in the heat of the day, but I did see a few common species including Taiga Flycatcher, Asian Brown Flycatcher, Common Tailorbird and Yellow-browed Warbler. Year ticks: Hill Myna, White-rumped Shama, Pale-legged Leaf Warbler, Siberian Blue Robin, Wedge-tailed Green Pigeon, Hainan Blue Flycatcher (total 258).